Wow! I have tred Wilton’s black and violet before, but didn’t get ANY of those colours! The violet broke into a nice fushia/blue/red mix, but the black just gave me this yukky grey/pink colour. I may have to try it again though! Any suggestions? Oh, and I love the green, it’s great contrast. 6. Turn off stove and let cool for a minute, then pour about 6 oz of water into each cup to dissolve dye paste. Stir with plastic knife. 6.5 Decide to add a bit more purple to the darker one so it won't come out black. Added about a pea sized dallop. By this point we have more dye than needed. That's fine with me. 7. Grab a big glass jar (Mine used to hold Shredded Pork from the Chinese Market) and two quart size freezer bags. 13. Add water to the jar, outside the bags. This was just to keep everything warm and the bags from tipping over inside the jar. 16. When I came back to take the yarn out, steam rose off the yarn. Oh yeah, it was warm in there. 17. Added about half a shot glass of vinegar to each bag, poked at the top which didn't take much color. Dipped each side into the remaining dye (both bags were left with teal green) in failed attempt for it to take some more color. 18. Added about a 1/4 cup of vinegar to another big jar, added enough water to almost fill it. 19. Transferred the yarn to the clean water jar. How do you like the feel of the Kona? Good: Once dyed, the kona was considerably softer. The yarn comes un-scoured (unwashed, shh, I actually asked what un-scoured meant) and I think my dying process (not the most careful to avoid temp changes) really made it softer. After, I was totally petting it and I work in a yarn store that sells cashmere and alpaca. Very affordable yarn @ ~$11-12/1000+ yards and I still have 500+ yards left. I didn't really enjoy skeining up this yarn (while unwashed) and found it to be thin for socks. I'd put it in the heavy laceweight category (and the seller's wife uses #0 needles (I asked when the package arrived because it was thinner than expected for intended sock purpose) ). It did puff up a bit after dying but if I put a bit of tension on it, it becomes fairly thin. SP, I hope it is okay if I knit a 2*2 swatch to check out gauge. And before I send you way-too-thin sock yarn. Your yarn looks great! Very impressive for your first try! So, when will we be able to order custom-dyed Freecia yarn? Hmm??? I was just out browsing at the Dye-O-Rama site and I must say that your yarn is the prettiest so far. Are you sure this is your first time dyeing? You seem to have the gift. Cheers! hrm. I am thinking I may just do the pyrex in the microwave. While I do have those big giant tubs, I do not have a vacuum cooker. Wow, that match to that picture is extremely close! I mean, I know you looked it up afterwards, but that's just amazing. Love the yarn. I am glad the green is going to stay. That is a hard color to get when you are trying for it! love the yarn. So pretty! Really does remind me of the Northern Lights (or rather all the pics of it that I gaze at dreamily and swear I will see for myself someday). Oh that is so beautiful! I love the colors and the name (and googled photo) are perfect for it! Good job! You are my hero. My idol and I love you so much! I have been trying SO hard to get a perfect purple with food type dyes. I have four small children and I dislike the idea of chemical dyes, you have saved me!!! HEE HEE HEE I'm giddy with glee! It seems that when you dye with food colors and add the vinegar in with the food color before the yarn absorbs the dye, it doesn't want to take up the blue dye. so it turns a wild bright fuchia. Nice but not what I wanted! 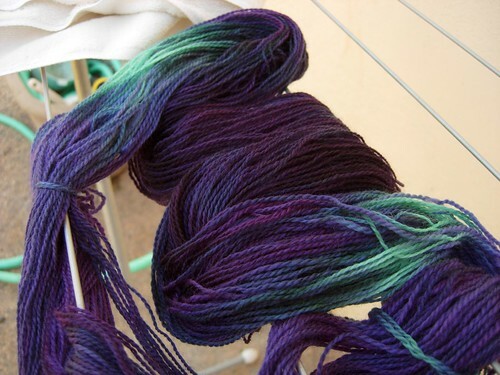 I found if I took that and spun it dry then overdyed with blue it made a decent purple. I think you got a different result because you let the wool take up the dye BEFORE you added the vinegar GENIOUS!!! Tommarrow I will do more test sample. HA HA HA I can't wait, I am literally wiggling and dancing with pleasure..I know I sound like an idiot , but I don't care. This page contains a single entry by freecia published on May 17, 2006 9:19 PM. Some Japan Photos Up was the previous entry in this blog. Emily Post Franklin, I need advice! is the next entry in this blog.